Five years after the liberalization of maritime transport in the majority of the Greek domestic routes (removal of cabotage) and the abolition of the age limit applying to vessels, the Greek ferry transport system is characterized by several major problems. These problems do not concern only important issues that deal with the functioning of the state and its interventions, such as port infrastructure problems, institutional issues, structure of the network design, but also issues concerning the offering services by the shipping companies such as malfunctions of the fleet, unjustified high tariffs and fares and non service of certain isolated routes and islands. 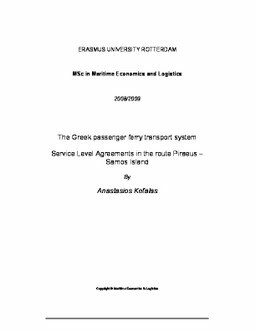 The Thesis examines these problems by presenting the Aegean ferry system and the Adriatic ferry system. The difference between these two systems will emphasize the necessity for individual approach of these two cases. Also we will examine the implementation of an Essential Terms Agreement through a case study in a very popular Greek route of the Aegean Sea. The main target of this case study will be to identify the needs of the islandic areas and to defend the main research issue that an individual technical consideration is required for developing transportation Service Level Agreement.